Missed last week? Exhausts - The Seven Things to Know. Take the Fast Friday Poll. Spark Plugs, light my fire! Spark plugs are a pretty basic maintenance item in most cars but with turbocharged cars, especially those making higher than stock levels of power, spark plugs become a vital part of the power delivery system. 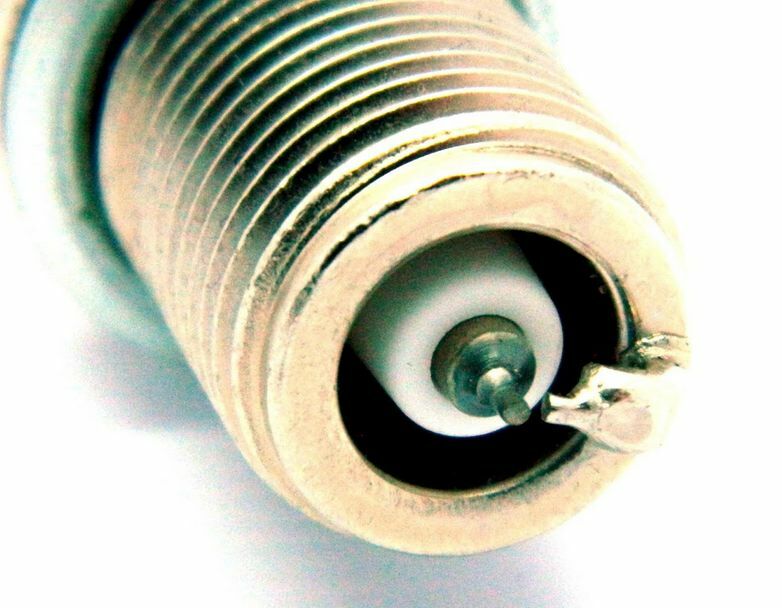 Additional tune up items typically include cap/rotor and spark plug wires but spark plugs take the brunt of the wear in the ignition and it’s not uncommon to have to replace them 3-4 times before any other ignition systems components require attention. With that said let’s look at the options out there and the benefits of each. Copper plugs: Whether Bosch, NGK, or otherwise the copper plug is hard to beat for many applications. OE equipped for non turbo cars and commonly used in turbo cars as well even though the OE called for platinum in many cases. Copper does have a lower melting point than other metals like platinum or iridium but for inexpensive replacement cost and consistent performance they are hard to beat. For a higher HP turbo car expect to get 20-25K when using these plugs. Platinum plugs: OE equipped in most turbo applications (Volvo) these plugs do quite well for cars that are younger and have fewer miles. However for models that are upwards of 80K on the odometer these might not be the best choice depending on exactly which units you get. See the images below. Note the Bosch Platinum plug on the left and pay close attention to the electrode in the center of the plug and how shrouded it is by the insulator. Now contrast that to the standard copper plug on the right and you can start to see how much more open that electrode is. For younger, cleaner burning motors this typically isn’t an issue but as an engine ages and more oil starts passing through the intake system from additional blow by and reduced PCV system performance that can lead to deposits that form on the plug and can intrude on spark ionization across the electrode to the ground strap. This is why some folks have switched to copper plugs even in the turbo engine. There are however Platinum plugs available that have a fully exposed electrode so that becomes the best of both worlds as Platinum plugs in that iteration have the best performance and longevity as compared to copper. Iridium: Iridium plugs came on the scene a while ago and were immediately boasted as near-magical in their capability. While they are certainly an improvement in spark plug technology they are after all just regular spark plugs with updated materials and design. The main benefit of these plugs is two-fold. First the iridium material used in the electrode is rated for a higher temperature range of operation and greater resistance to corrosion from combustion chamber gasses. Secondly the electrode in the iridium plugs tends to be much smaller as the material can handle higher temps without melting away, the smaller center electrode promotes more consistent spark jump as spark ionization has the best chance of occurring when the spark jumps from a sharp edge. 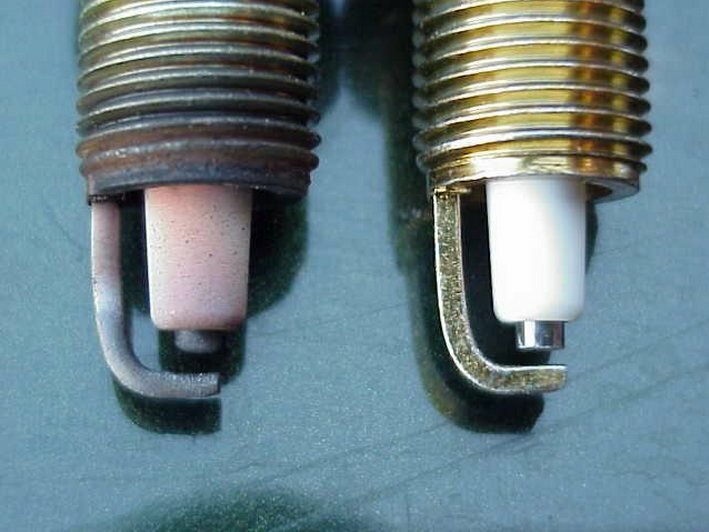 The spark plug on the left exhibits the rounded center electrode that has worn over time while the spark plug on the right shows the appearance of a brand new electrode that has nice crisp edge for the spark to jump from. This is the nature of why a spark plug wears out from both center electrode wear and ground strap wear. The center electrode is reduced in size, again due to the nature of iridium to withstand the higher heat without melting away, but the ground strap has been redesigned to not only provide a more pointed tip but also has been pulled down and to the side of the center electrode which reduced flame front propagation in the cylinders as the combustion is initiated. These plugs are what we’ve been seeing the best results from as of late and it’s what I recommend to anyone who’s been having ignition system issues they can’t seem to solve. While they’re not magic they are well built and designed which means for you and me we literally get the best bang for our buck! Questions, comments, other? Post up in the comments below! Questions, comments, arguments and freakouts accepted and encouraged. How long do they last and why don't they sell these as normal use plugs? It's a side gapped plug that was designed that way from the get go. I like it. So, the heat range is comparable to the 8 heat range NGK plugs? Are you having problems with them fouling from being too cold for daily use? I recently did a tune up on my 2000 S80 T6 with 138k miles. I used the OEM Volvo plugs from IPD which I'm pretty sure were platinum. Was that a bad call? KLR142 wrote: How long do they last and why don't they sell these as normal use plugs? These typically last 25-30K with regular driving mixed with some spirited driving. Why don't they sell these as normal use... not sure you'd have to ask Bosch. I'd guess it's due to cost. I like them too, they really help those cars that are hard on plugs especially those at or near 300bhp. No real issues with the heat range. Oe plugs are a bit too hot IMO anyway and with increased performance it just gets worse so these help considerably. jkdjim wrote: I recently did a tune up on my 2000 S80 T6 with 138k miles. I used the OEM Volvo plugs from IPD which I'm pretty sure were platinum. Was that a bad call? Not necessarily, depends on the level of power your car is making over stock ( if any ) and which platinum plugs you received. ARD-Lucky wrote: These typically last 25-30K with regular driving mixed with some spirited driving. Why don't they sell these as normal use... not sure you'd have to ask Bosch. I'd guess it's due to cost. Nice. Regarding cost, they aren't THAT much more expensive than some of the other off the shelf stuff that's has some of the beneficial design tricks(tapered ground and tiny electrode). Denso Iridium Powers(IK20 is standard heatrange for a whiteblock, 22 is one step colder) have a U groove in the ground strap in addition to the taper, giving it something "special" over the NGK Iridium -IX(BKR6EIX stock heat range, BKR7EIX one step colder, 8 for two). On the early P2 R cars, I think they originally were spec'd to come with colder plugs such as the IKH22, but we've had a few that are happier running the hotter IKH20 and they have cleaner porcelain after use. Hence my hesitation with going too much colder. Ps. These work in the redblocks as well, they just don't have the larger hex on them, correct? matthew1 wrote: Platinum plugs - OE equipped in most turbo applications (Volvo) these plugs do quite well for cars that are younger and have fewer miles. However for models that are upwards of 80K on the odometer these might not be the best choice depending on exactly which units you get. This NGK video suggests that multiple electrode platinum plugs are better at decreasing carbon fouling. Yes, copper based plugs may be better when frequent short-trip driving and idling exists, along with oil consumption issue. Yes, "Platinum plugs available that have a fully exposed electrode so that becomes the best of both worlds as Platinum plugs in that iteration have the best performance and longevity as compared to copper."